Who qualifies for Instruct funding? Or use the "Help?" button when it appears within the proposal pages for additional explanatory text. Note: Click on a section title to expand it. Click again to hide the section. 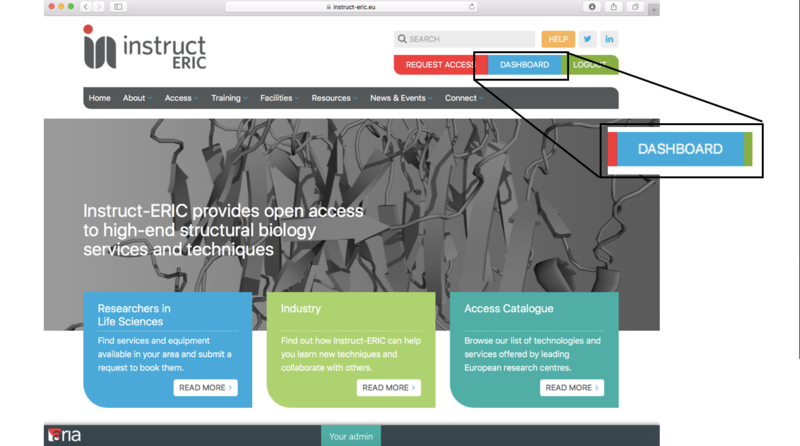 Go to structuralbiology.eu and login. Click “Dashboard” on the right of the top navigation bar. A list of any past and present proposals should appear along with their current status. Proposals are listed in order of increasing proposal ID (PID) number i.e. in the order in which they were first started. The most recently started proposal will be at the bottom of the page. Select the appropriate proposal and click either "View proposal" to view a previously submitted proposal or "Continue proposal" to resume working on a proposal which has not yet been submitted. Select the type of service or technology you wish to access. The top list of services are accessible through Instruct. There is a second list of services accessible via alterative access routes e.g. iNEXT, CORBEL. 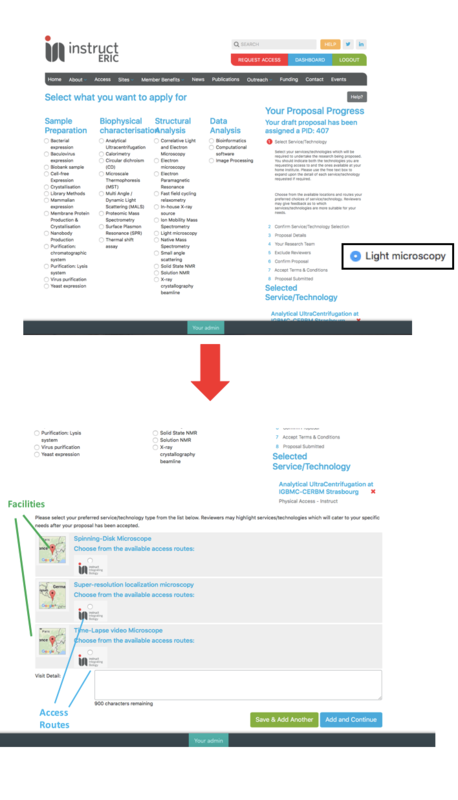 To view and select these click "Show more services/technologies available through alternative infrastructure routes". Once the type of service has been selected using the checkbox, a list of centres providing that service and access/funding routes will appear. Select an facility/access route from the options available. (optional) In the "Visit Detail" box beneath, list any other information relevant to the planned visit. Multiple services can be selected if required by clicking "Save & Add Another". When all desired services have been selected, continue by clicking "Add and Continue". If multiple service visits have been requested, the order of these visits can be changed by dragging and dropping (by clicking and holding the "=" icon) the visits into the desired order from top to bottom. If all desired services have been added and the order of visits is correct click "Continue Proposal" to confirm. Fill in all fields of the proposal details form. For advice and guidelines on proposal content please see our proposal guidelines. Clicking the "Help?" button at the top right corner of the proposal form activates explanatory text from points marked "?". 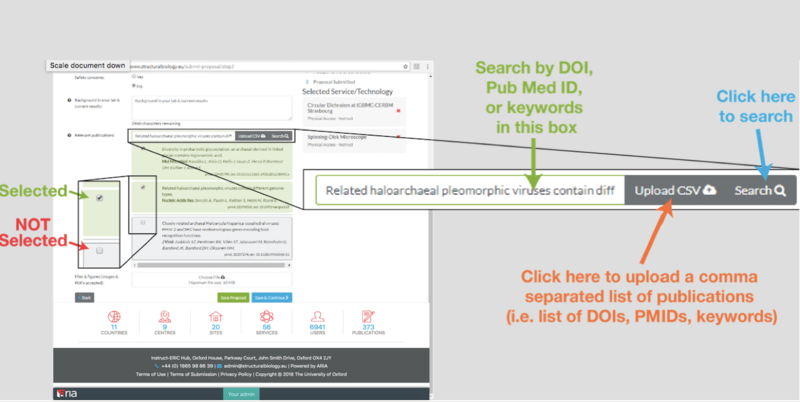 Publications relevant to the proposal can be added by DOI, PMID or keyword search by typing the search term/DOI/PMID into the search box and clicking "Search". If a publication returned by the search is not correct, or you no longer wish to include it in the proposal it can be unchecked by clicking the left hand side checkbox. Publications which have been deselected will appear grey, and selected publications will remain green. Multiple publications can be added simultaneously if they are saved as comma separated items (DOIs, PMIDs, keyword strings) in a `*.csv' file using the "Upload CSV" button. This function is currently not working. Select the PI for the project (this is by default the proposal owner) and any colleagues in the project team from the home laboratory. Any scientist performing a visit pertaining to this proposal must be a member of the proposal team to be eligible for any reimbursement. The PI and each member of the team must be registered with an ARIA account. If the PI is different from the proposal owner, the PI will be asked to confirm their association with the proposal. If any possible reviewers have a potential conflict of interest please state them in the "Exclude reviewers" box. Click "Save and Continue" when complete. You will now be presented with your completed proposal. Verify that the proposal is complete and correct. 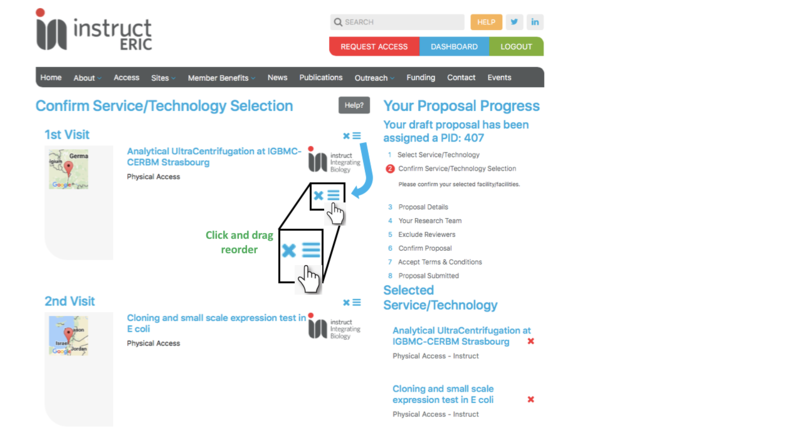 Any details of the proposal can be changed at this stage by navigating to previous pages using the back button. Once satisfied that the proposal is complete, click "Submit Proposal". There will be a further step before the proposal will actually be submitted. If you are satisfied and agree to all of the terms of submission click "Submit Proposal" one final time to submit the proposal. The terms and conditions for Instruct proposals can be found here. The proposal is now submitted and can no longer be modified. 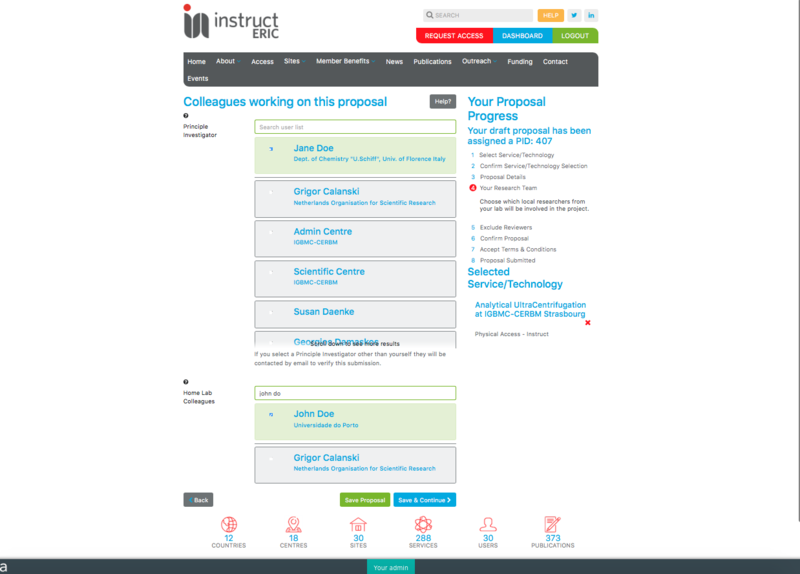 The proposal progress can be tracked in the "Dashboard" section of the website.